This feature is included with most secure gateway accounts. A "virtual terminal" is a payment transaction processing user interface that runs in the browser program of a computer, phone, or tablet with an internet connection. 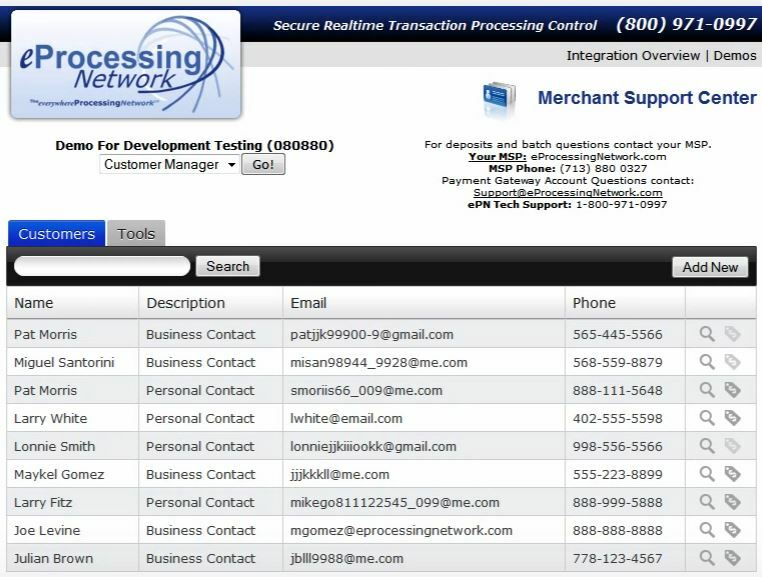 The online virtual terminal is a convenient method used by office personnel for processing "card-not-present" mail order and telephone order payments, but can also be adapted for face-to-face counter sales situations by connecting a USB or Bluetooth card swipe appliance and receipt printer. 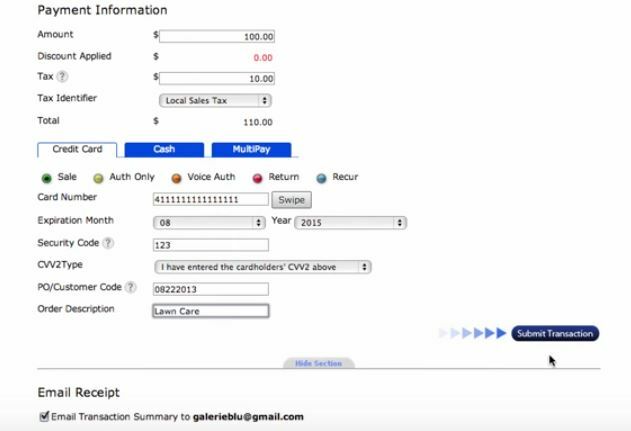 This gateway account feature accommodates internet payment transactions that are conducted by the buyer. The website portal is accessed by a hyperlink to its payment page. Here the customer enters the payment amount and invoice number and then continues to the secure gateway where the sensitive cardholder data is entered and the payment transaction information is submitted. An email receipt is automatically sent to the buyer and the merchant receives an email notification indicating the received payment. 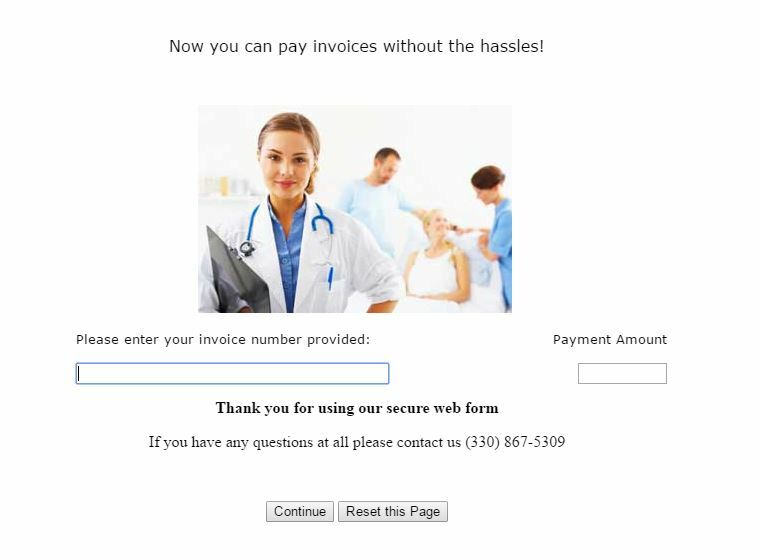 The portal link can be sent via email to customers for paperless email billing procedures or with past-due payment reminders. Portals can be graphically configured to match the look and feel of the merchant's website and can also be setup as a mini shopping cart for fixed cost items. Using the secure server of the gateway provider is not limited to processing payment transactions. The Customer Data Manager is an option that permits secure online storage of sensitive customer contact and account information. This is convenient for processing repeat customer payment transactions as well as recurring billing scenarios. Additional benefits can extend to marketing activities. The online database of customer information can be used for building contact lists for purposes of conducting direct mail, email marketing, and texting campaigns. Secure online storage of customer information also supports PCI-DSS (Payment Card Industry Data Security Standards). All merchants are required to comply with PCI-DSS and attest to secure handling of their customer's cardholder account data. With a gateway account, you can add a mobile phone app to manually conduct card-not-present payment transactions or add a secure card reading appliance to perform face-to-face transactions with your smart phone or tablet. Payment receipts are sent to the buyer by email or text. Apps for mobile phone processing are offered for iOS and Android platforms. A variety of accessory devices are also available to support card swiping, chip card dipping, and receipt printing with either phone jack or wireless Bluetooth connectivity. For merchants who already have a product oriented website, the ability to add shopping cart functionality can easily be implemented by using ePNCart. This tool provides a simple technique for adding "buy buttons" and a shopping cart feature which then uses the secure gateway for checkout purposes. Configuration is accomplished with a user interface that generates the html code that the merchant can easily use for constructing "Add to Cart" button links on their website. 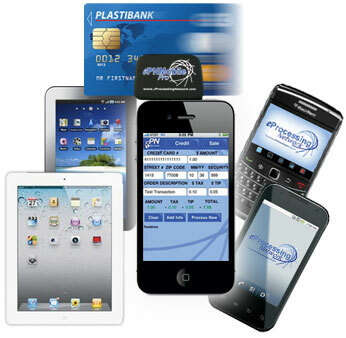 ePN mobile software running on a tablet computer provides a low cost alternative to a dedicated credit card payment processing terminal. 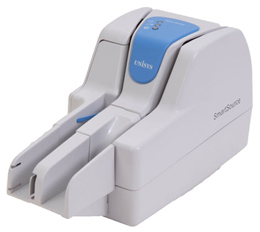 Accessories for magnetic stripe card swiping, EMV card dipping, and receipt printing are also accommodated. By now, everyone realizes that EMV chip cards are the new standard for conducting face-to-face, "card-present" payment transactions. Acceptance of these cards requires an "EMV enabled" countertop credit card terminal or appliance. 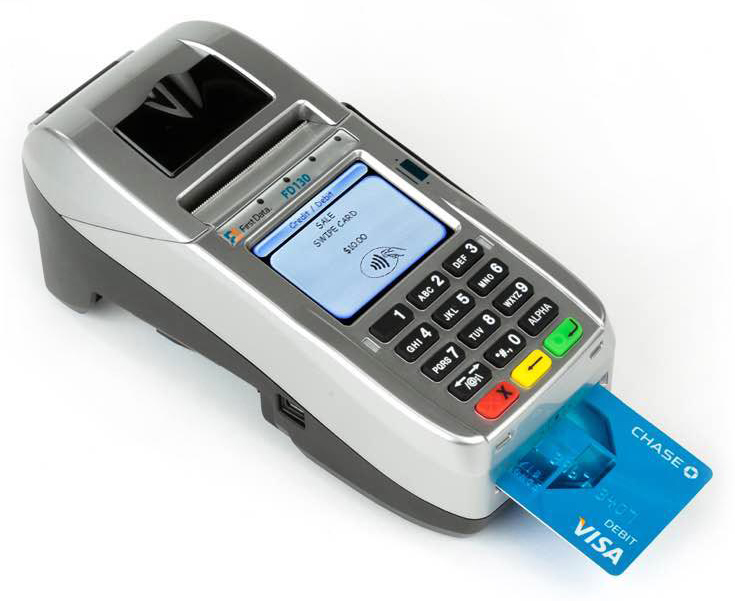 Merchants must embrace EMV chip card "dipping" to relieve themselves from potential fraud liability in the event of a transaction dispute. We provide EMV-enabled devices at cost. No-charge setup is provided for merchants that prefer to bring their own device. Connected PIN pads are available when this makes sense, such as to permit customers to insert their card themselves or for debit card cash withdrawal scenarios. 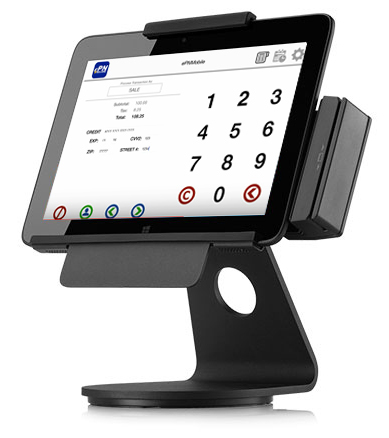 POYNT is an intuitive, tablet-style smart terminal for conducting card payment transactions. 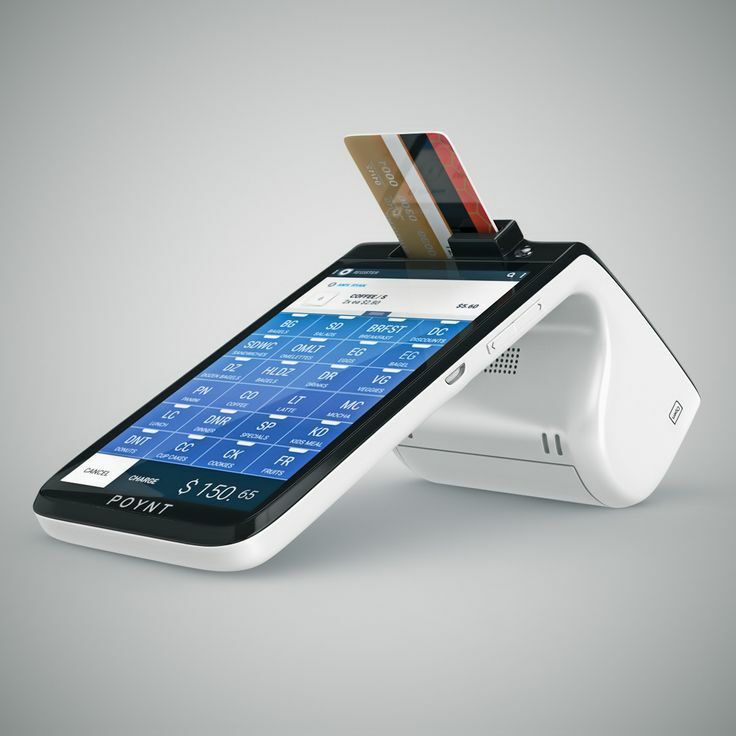 It is totally wireless and reads magnetic stripe cards and EMV chip cards as well as smart phone mobile wallets using NFC. The system features two touch screen displays - the main, merchant-facing display permits the payment transaction details to be entered, while the smaller, customer facing display confirms transaction information, permits PIN entry, and accommodates digital signature capture. The conveniently located card slot is accessible for either the merchant or the customer to swipe or dip the card. A built-in printer supplies on-the-spot receipts and the customer can also enter an email address to automatically receive an electronic receipt. With available 3rd-party apps, the functionality of POYNT can extend to inventory control, QuickBooks synchronization, hospitality table-side POS, employee time management, and more! 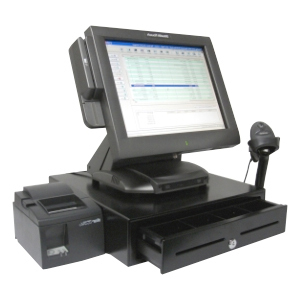 A complete point of sale system permits management of an inventory database so that a bar code scanner can be used to input item-by-item purchase information. The sales transaction interface will build an itemized list of SKU's with pricing and permit the transaction to be settled with a variety of payment types, including credit card, cash, and checks. Interface to a cash drawer and receipt printer complete the system. 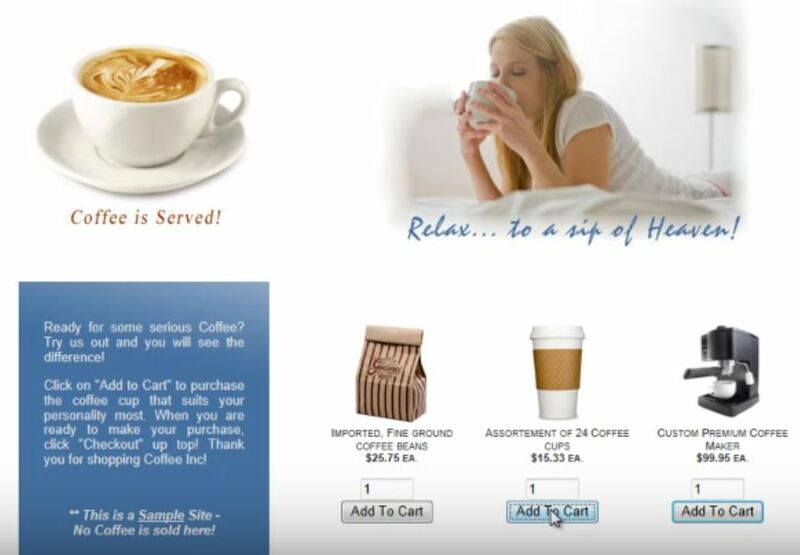 We provide a JAVA-based point-of-sale software solution that can run on any Windows based PC. Inventory is managed in a secure, cloud-based environment and can be accomplished with any internet connected device. We do not provide the computer hardware as this is readily available for merchants desiring to configure their own system that is ideally tailored to their needs. Check Processing and ACH Services help merchants avoid trips to the bank for making check deposits and shorten the time required for payment settlement and funds availability. A MICR check character reader or check imager/scanner is used to convert the paper check to an electronic payment transaction or paperless deposit. These devices connect either to an internet-connected computer or countertop credit card terminal. Process-Direct represents feature rich and integrated check and ACH processing packages, which include the scanning and software solutions for the office, along with online capabilities that permit your customers to easily submit payments right on your website by echeck or ACH transfer.